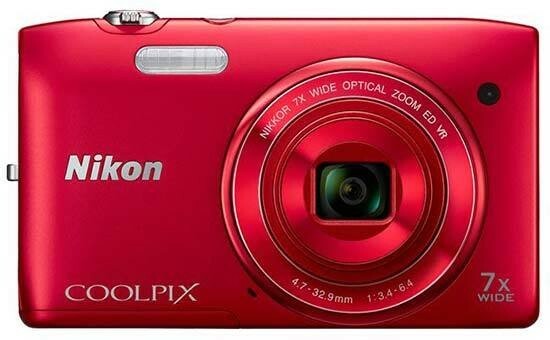 The Nikon Coolpix S3500 is a slim-line digital compact camera, just 20.5mm thick. It features a 20 megapixel sensor and, despite the thin frame, sports a 7x optical zoom with lens-shift vibration reduction. Couple that with subject tracking auto-focusing,720p HD video recording and a 2.7-inch screen, and it sounds perfect for days out at events. Priced at £99.99 / $139.95, the Nikon Coolpix S3500 is available in orange, black, pink, silver, red and purple. Tear open the box of your new Nikon Coolpix S3500 and you're first faced with a thick book that demands reading before playing with your new toy. Before you throw it behind you, it's only a Quick Start guide and is quite brief. However, it will let you know how to set the camera up for proper operation. Once that's out of the way, it's time to play. The camera is supplied with View NX2 image editing software on a CD – which also holds the full manual – but we can worry about that once some pictures have been taken. The S3500 takes a lithium ion battery and this is included in the box along with the charger and any necessary cables to plug it in and get pictures to a computer. Of course, you may have an Eye-Fi memory card and if you do, the S3500 is wireless transfer capable as long as you have one of these cards. It works by detecting a free wi-fi hotspot. Once there, it uploads pictures to a location of your choice. To get to the memory card, the image has to pass through the Nikon EXPEED C2 processor, which is hardware taken from the DSLR range. EXPEED is Nikon's dedicated imaging processor (everyone has one these days) which is designed to process images to the best quality possible. On some lower end compact cameras, the processor hasn't managed to cope with the high resolution of the sensor. The S3500 comes with a 20 megapixel sensor which could cause problems with noise, but the test will confirm how the camera copes. One of the great things about the S3500 is that Nikon have fitted a 7x optical zoom into what's classed as a particularly slim body. The zoom range is 4.7 – 32.9mm, but scaling up to 35mm terms, that equates to a 26 – 182mm zoom. That's not bad in a littler camera like this and will certainly help with subjects too far away – at a Zoo, for example – or if you simply can't be bothered to walk there. The layout of the S3500 is essentially the same as the other Nikon Coolpix cameras in the range. Of course, if it's not broken, you don't fix it and that certainly applies to the way the buttons are arranged on digital compacts because that's not changed for years. The tiny power button on the top of the camera sits pressed slightly into the body with a green light around it which comes on when the camera is powered up. The shutter release is to the right of it which has the zoom ring around it. The zoom ring is very small, suited perfectly to the S3500. On the back, the large LCD screen takes up most of the space, like an annoying older brother in the back of a car on a long drive. The buttons are left squashed to one side for the whole journey. They take on the typical layout of four buttons surrounding the navigation pad. The button with the green camera – like some others – has a dual purpose. It works with the button to the side of it to toggle between playback and shoot modes and when in shoot mode, accesses the Scene menu. There are four tabs in the Scene menu. Alongside the usual Auto and Scene modes, there's the Digital filters and Smart portrait. The Digital effects has some interesting filters to play with such as High key, Low key, Painting, two Toy camera options and Cross processing. The Nikon Coolpix S3500's Main menu is split into three sections. The left hand side shows the three tabs you can access with the options allocated to each section showing in the centre panel. The centre panel is a lighter grey than the dark grey of the left hand tab. This aids in differentiating where you are in the menu. The right hand panel is also dark grey and displays any sub-options. For example, the right hand panel will show the various resolution options when you highlight Image mode. The front of the Nikon Coolpix S3500 is brushed metal and the back plate switches to black plastic. The screen bulges out of the back slightly, giving the main body of the camera a deeper look to it. We like the sweeping curves of the design, but we think that over use of the camera could result in cramped fingers due to the diminutive size forcing you to curl your hands round more than is comfortable. The battery and SD card slot is covered by a sliding plastic door. It's backed by some metal to reinforce its sturdiness, but there's no lock. The only play in the door comes from the hinge when it's open. The tripod bush is plastic which, with high use, will wear down faster than a metal version. The latter types are more likely to find more use with a camera that has a larger zoom range than the S3500. It's likely the image stabilising system will cope with any situation you should find yourself in. We've tested a few Nikon digital compact cameras recently and we're impressed with how fast they are. Start up time is typical of the new Nikon range at a fraction over two seconds, but around half a second faster than a comparable compact from another manufacturer. Continuous shooting is continuous and not a burst mode. It took eight photos in a ten second period for an average of 0.8fps (frames per second). Downloading those pictures took around 15 seconds more. The first three shots run at around 1fps, but after that it slows down as the buffer fills up. Images can be played back on the S3500 regardless of whether the camera is switched on or off. When you first switch over to playback, a brief outline of the shooting settings will be shown on screen, such as the file number, resolution, date & time, that kind of thing. This disappears after a few seconds leaving the full picture. Toggling the zoom switch will either zoom into the picture or display a series of thumbnails for faster navigation. The Playback menu is more geared to sorting out your pictures if you've made a mistake such as Quick retouch, D-Lighting and Glamour retouch. You can also create a slide-show, protect pictures, rotate them and delete them. The digital effects are still available here as well if you didn't use them at time of shooting and changed your mind. This feature can be switched on or off in the Main menu and if you want to use it, press the OK button when reviewing the picture.